The Jehovah's Witnesses were the first organized group in America to generate what has been termed "vigilant" or "disciplined" plan of litigation to expand the boundaries of the First Amendment. In a period of 15 years, Watchtower Bible and Tract Society lawyers won Witnesses the right to distribute literature door-to-door, on public streets and on streets owned by private corporations and the federal government; the right to carry out these activities without first securing a permit or paying a tax; the right to use sound-amplifying equipment to spread their beliefs; and the right to be protected from continued arrests under unconstitutional ordinances. By implementing an extensive, detailed legal plan to overturn ordinances that interfered with their evangelical mission, the Watchtower Bible and Tract Society broadened protection under the First Amendment not just for their members, but for all Americans. The overwhelming success of the plan shaped mass media law, the application of the First Amendment, and group litigation in the United States. 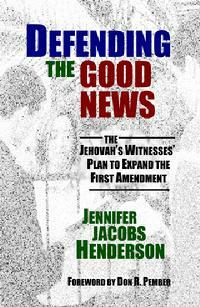 This book explores these issues and examines the Jehovah�s Witnesses� plans to expand the First Amendment even further. Dr. Jennifer Jacobs Henderson is an associate professor of communication at Trinity University, specializing in issues of media law, the ethics of media, and the use of online social networking and virtual worlds for political and social action.